Hell To Pay were a Melbourne band who existed from around 1991 to 1993. They were, to coin an often over used phrase, ‘the real deal’. Any band that included both Ian Rilen and Spencer Jones in their ranks was always gonna be top shelf, and so they were. 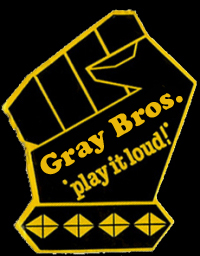 If you wanna talk inner city supergroup, then look no further than this lot. Rilen was on guitar and vocals. Spencer Jones was on lead guitar and vocals. Jon Schofield (ex Grooveyard, Paul Kelly) was on bass, and former JJJ DJ Tony Biggs was on drums. Cathy Green of X also played bass on the album. The band were signed to Red Eye Records in Sydney and released a CD single called ‘Saints & King’ in 1991, and an album, ‘Steal It’ in 1992. Both are long out of print, but are essential if you are fan of either Jones or Rilen. All the tunes are gritty and real and highlight Rilen’s talent as a writer. Lobby Loyde told me once “Ian Rilen is a true genius’, and these tracks reflect that. No one ever came close to Rilen for sheer authenticity and street level realism. I was fortunate to see the band on three occasions, twice at Max’s, Petersham, and once, on a Tuesday night, at the Crows Nest Hotel. 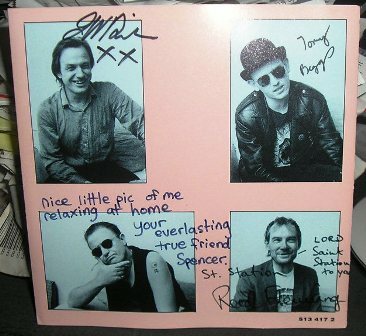 The Rockbrat also managed to get my copy of ‘Steal It’ signed by the band. I am reposting this blog that I originally wrote back in 2010 to raise awareness of Spencer Jones’ illness, and his need for financial assistance. News that Jones has become seriously ill and unable to work has sparked numerous benefit shows around the country, headlined by The Drones, Paul Kelly, Dave Faulkner and more, and a GoFundMe campaign. As the news blurb says,”Spencer P Jones, guitarist, singer and prolific songwriter is seriously ill. He has performed live consistently for more than 30 years, but has not been able to work for several months due to his illness. Author of catchy and poignant tales capturing Australia’s underbelly, driven by his signature guitar sound (Australian Guitar magazine rated Jones as one of Australia’s Top 40 best guitarists), and delivered in his melodic but menacing snarl, his impact on the Australian and international rock scene is unsurpassed in this country. Spencer came to prominence as guitarist, singer and songwriter with The Johnnys (a band so loved by Neil Young he said he wished he could bottle their sound and spirit) and as one part of inner-city swamp rock supergroup the Beasts of Bourbon. Moving out on his own with his 1994 debut Rumour of Death, Jones has gone on to release ten impeccably crafted albums in his own right . If you are unable to attend one of the shows, but would like to contribute to help Spencer with his medical costs you can do so by donating to this fund. Please support one of Australia’s musical treasures. 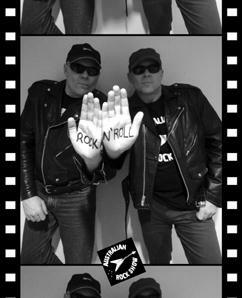 Rockbrat is your copy of ‘Steal It” on vinyl? CD. Was not issued on vinyl. 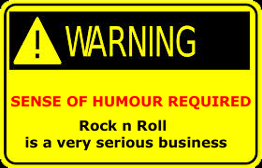 Previous Previous post: Rockbrat Wonders: Where Has The Humour Gone In Rock n Roll ?